We believe Powerband® - Kre-Alkalyn® + Vitamin E is going to be the become the preferred version of Kre-Alkalyn® that people will want to take in the very near future as they discover differences in their training and recovery rate. Its not just body builders who will love this formula - all athletes will love it too and any aged person who needs to optimize their energy for their day will also very much appreciate the optimized energy capacity. We are offering this product in a 160 capsules size in either gelatine capsule version or for those that prefer it, also in vegetarian capsule version. 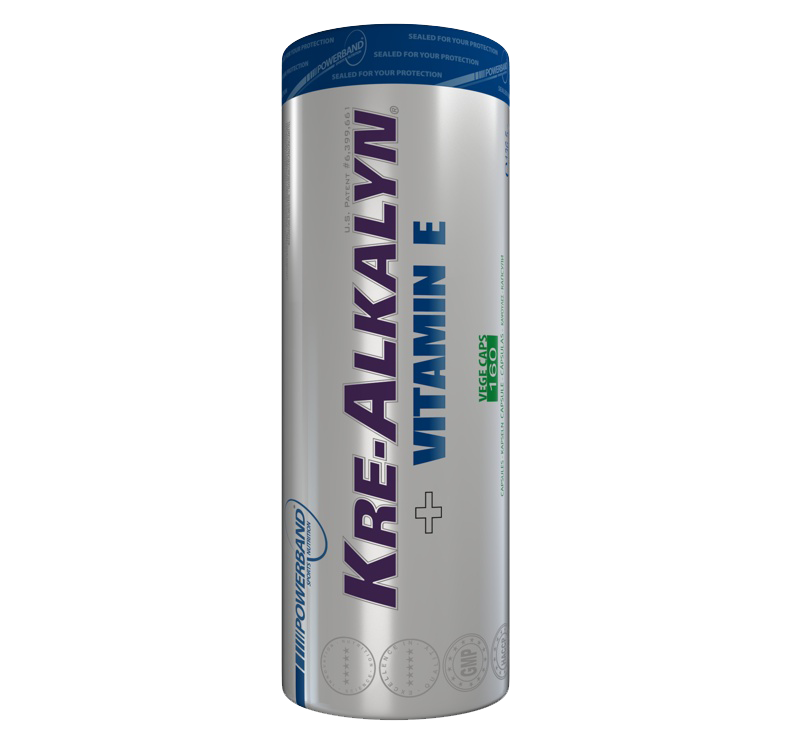 When it comes to Creatine, Kre-Alkalyn® has proved over the years to be the indisputable KING of Creatine. We chose to put inside our ground breaking product Kre-Alkalyn® over all other sources or forms of creatine because it has proved itself to be the preferred source and form of creatine by many athletes and trainers. Vitamin E is included in this formula is because a research study concluded muscle creatine levels can be influenced by a deficiency in vitamin E - essentially if you are deficient then you may have an impaired ability to hold as much creatine in the muscle tissue fibers. In the USA it is estimated to be 95-98% of the population are deficient due to the many convenience and processed foods being eaten these days and also using too much heat in the cooking process destroying most of the vitamin E that is there. So no mater how much you supplement of creatine, if you are you are deficient in Vitamin E then you are potentially reducing how much the muscle can store creatine in it. The study looked at 3 groups. Those that were deficient held significantly less creatine than those in the control. When the group that were deficient were corrected with supplementing Vitamin E and the last stages of the study their creatine uptake was improved to the same as the control group who had normal vitamin E levels in their bodies. Later this month (May) there is going to be an article published in a Peer Reviewed journal by authors from a European Medical University looking into the mechanisms surrounding creatine uptake into muscle tissue. There are cheap synthetic forms of Vitamin E with the dl prefix in front of it that are half the price of the d form and the bio-availability of this form may be as low as 20% of the d form. With the EU and its restricted upper limit maximum daily dose of being 400 IU (per 3 capsules) we have gone for the most bio-available form to maximize the ability of the body to correct any deficiency. Remember also that correction of a deficiency is over time so that the effect will become more pronounced each week of use. Although the international unit (IU) standard for vitamin E was meant to equalize the differences between natural and synthetic vitamin E, studies show otherwise. Last year, the National Academy of Sciences (USA) recognized natural vitamin E as the standard by which to judge synthetics. Natural vitamin E contains the molecule humans assimilate most effectively. Researchers at Oregon State University, Corvallis, found the human body excretes synthetic vitamin E three times faster than the natural form.